Saturday I took a class through BAMQG with Sarah Goer. Sarah is a GREAT teacher and her class, Planned Improv, is fabulous. I liked it, mostly, because it was a design technique that I can use beyond the class. It is a technique that could be similar to using Electric Quilt, but sometimes I need to sit down with graph paper and scribble. I went to class thinking that I would expand the technique and use it for one of the Niece-phews quilts, if it worked out. I had one nephew in mind, so I brought reds for the foreground and dark grey for the background. I thought I could make a pillow cover for a gift if i was not willing to commit to making a quilt using the technique. The technique is great. Mary C asked me where this technique had been all her life and I wondered the same thing. Another thing I liked about this technique is that it isn’t quite improv, but it is not a buttoned up pattern either. I am pleased with the way the block came out. I think it has potential for becoming a quilt. 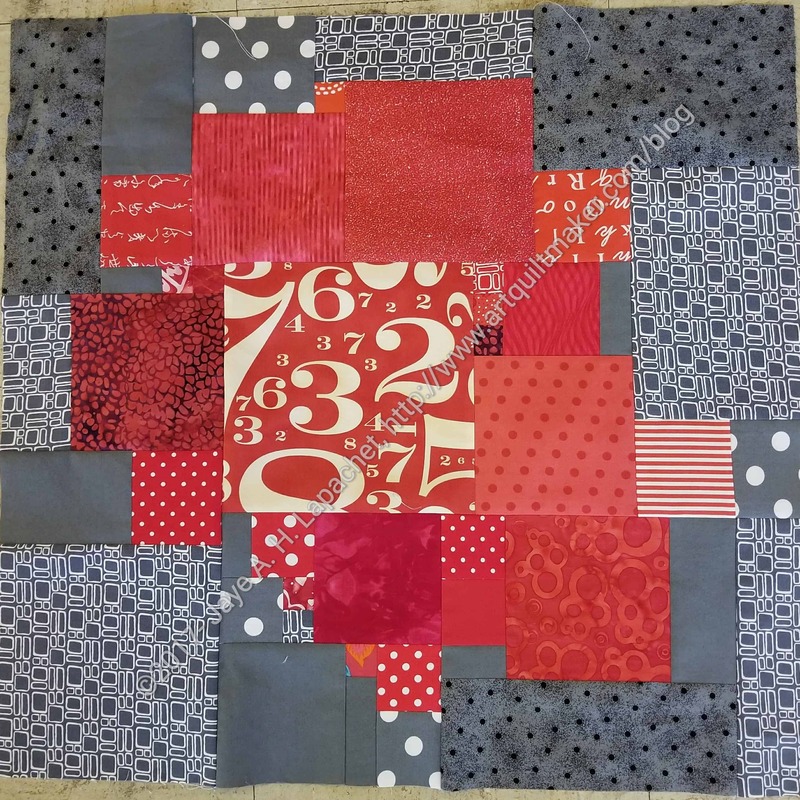 The block is 25×24, so I don’t have to make many of them to have a large lap quilt. I have some squares cut, so I can make another block soon. I would recommend Sarah’s class.